With CES news in full wing Sony have announced a new look, sleek stainless steel SmartWatch 3 to roll out in February 2015. In addition we are to see the introduction of a prototype concept, an all-in-one headset-style device with sensors optimised for running called the Smart B-Trainer. At CES 2015 Sony introduced new products, partners and experiences to its evolving SmartWear range – a sleek stainless steel edition of SmartWatch 3, new Lifelog collaborations, and concept wearable devices, including a multi-sensor, waterproof headset prototype, from Sony Corporation, designed for optimising performance and providing real time insight on the running track. At CES last year, Sony first showcased SmartBand SWR10 – a 24/7 wearable device; fully waterproof1 (rated IP58) despite its exposed microUSB port. A light, unobtrusive wearable that first featured Sony’s modular approach – the independent “core concept” – it allowed the technology to be worn in different colours and styles, to suit individual taste and personality. Over the past year, Sony Mobile has worked with creatives and brands from across the lifestyle, fashion, and design spectrum to explore custom apparel, establishing collections for Sony SmartWear from the likes of Jack Vartanian, ALTEWAISOME, and Ted Baker – and most recently, the popular women’s lifestyle brand, ROXY. After launching in partnership this past Autumn with Google, SmartWatch 3 is Sony’s latest generation “SmartWatch”. Sony unveiled the new stainless steel edition of SmartWatch 3, rolling out globally from next month. SmartWatch 3 in beautiful stainless steel matches contemporary with timeless aestheticism for a premium look and feel. It features a 1.6” 320×320 TFT LCD Transflective display for visibility in bright sunlight, and is of course water protected2, rated IP68 – it charges via a standard microUSB port. Golfshot and iFit are two developers already creating Android Wear experiences with SmartWatch 3’s standalone capability, for both performance on the course and track respectively – from January, every SmartWatch 3 user will have exclusive access to the premium Golfshot and iFit apps out of the box3. Sony also announced a new collaboration with Virgin Atlantic – to explore SmartWear initiatives together, to develop unique solutions using Sony’s SmartWear products to support operational activities and enhance the customer service experience for Virgin Atlantic customers. More news will follow over the coming months. Downloadable from the Google Play Store, Lifelog is the popular Android app built to help you set personal goals, monitor progress, get to know yourself better and make smarter choices about your health, entertainment, and more. A new web interface, lifelog.sonymobile.com, is launching during CES 2015. It uses open API functionality and latest HTML5 technologies, for a more visual experience. The site will work with any screen size, from your smartphone to your tablet to your TV – all you’ll have to do is log in using your Sony Entertainment Network4 account. The new feature reflects Sony’s strategy to regularly bring new functionality and features to Lifelog, to keep the experiences as current as they possibly can be. Off the back of launching the software development kit, Sony Corporation is also sharing new applications for current prototype, SmartEyeglass Developer Edition, along with a new conceptual style, SmartEyeglass Attach! – a single lens display module for attaching to regular glasses, allowing developers to create applications for sport and performance. 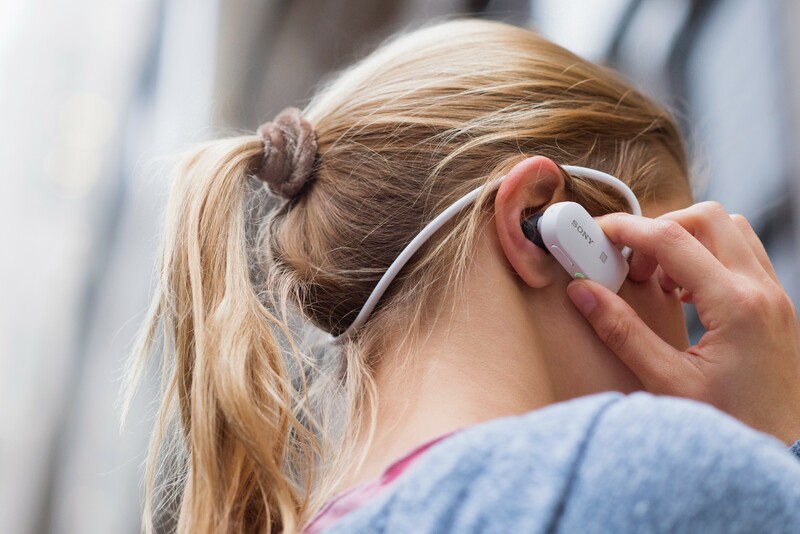 Sony Corporation’s Smart B-Trainer prototype was also introduced – a waterproof all-in-one headset style device with multi-sensor capability specifically designed for runners. The current prototype features inbuilt memory – and will provide voice coaching, as well as music playback, intelligently suggesting the most suitable soundtrack to accompany a runner during a workout. Follow @SonyMobileNews and #SonyCESfor all the latest news, views and information.